Houston Mayor Sylvester Turner on Tuesday gave his strongest endorsement to date for constructing a physical coastal barrier to protect the region from deadly storm surge. HOUSTON — Houston Mayor Sylvester Turner on Tuesday gave his strongest endorsement to date for constructing a physical coastal barrier to protect the region from deadly storm surge during hurricanes. Though such a barrier system would not have guarded against the unrelenting and unprecedented rain Hurricane Harvey dumped on the area, Turner — one of the region's last leaders to endorse the "coastal spine" concept — said at a Tuesday news conference that he believes it is crucial. "We cannot talk about rebuilding" from Harvey "if we do not build the coastal spine,” he said. With Harvey — which was downgraded to a tropical storm by the time it reached Houston — "we again dodged the bullet." Constructing such a system has been a point of discussion since 2008, when Hurricane Ike shifted course at the last minute, narrowly sparing populated communities like Clear Lake and the Houston Ship Channel — home to the nation’s largest refining and petrochemical complex — from a massive storm surge. Scientists have modeled worst-case scenario storms that make clear the potential for devastation, which The Texas Tribune and ProPublica detailed extensively in a 2016 investigation. They also have urged local, state and federal elected officials to pursue infrastructure solutions, which they expect the federal government to fund. Last year those scientists and officials told The Texas Tribune and ProPublica that a catastrophic storm likely would have to hit Houston before they could convince Congress to fund such an endeavor — estimated to cost some $5.8 billion for the Houston area alone and at least $11 billion for the entire six-county coastal region. Such an ambitious public works project has never been built in anticipation of a natural catastrophe. Turner and other leaders are clearly hoping Harvey fits the bill. 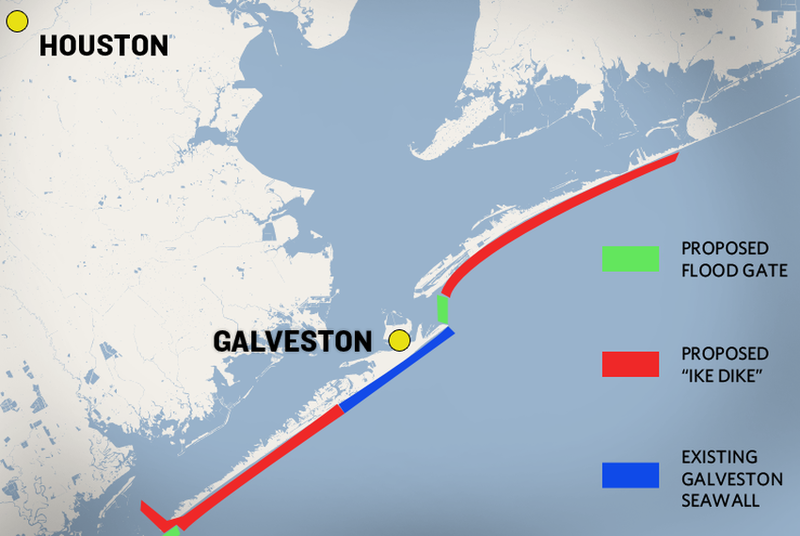 They have suggested that the federal government could provide funding for a storm surge barrier — often referred to as the "Ike Dike," a proposal first offered up by Texas A&M University at Galveston in 2009 — and a variety of other storm protection measures as part of an overall Harvey relief package. But the $15 billion Congress has approved for Texas so far can't be spent on a coastal barrier; the money can only go toward rehabilitating flooded areas. That means local and state officials will either have to depend on Congress to fund something completely separate — a scenario many are doubtful of — or cobble together other funding. At both the state and federal level, talk of protecting the Houston area from big storms has in recent years been dominated by the coastal barrier concept. U.S. Sen. John Cornyn, R-Texas, and Texas Land Commissioner George P. Bush have been leading an effort to secure federal funding for the coastal spine. In April, Bush and several other officials, including Turner, wrote to President Trump urging his support. But the Ike Dike would only protect coastal areas from catastrophic storm surge; it would do nothing to prevent flooding damage from torrential rain, which is almost entirely responsible for the damage Houstonians suffered from Harvey. Other flood protection ideas — either underfunded or long-abandoned — have received renewed attention since Harvey. On Tuesday, Turner joined local officials in expressing support for a long-delayed reservoir project that experts say would've saved thousands of Houston homes from flooding during Harvey, along with three bayou widening projects estimated to cost a combined $130 million. Turner said the city shouldn't have to choose one over the other as it seeks federal funding. "I don't think we need to pick one," he said. "... We know we need another reservoir. We just need to step up and do that — the same thing with the coastal spine." A spokeswoman for U.S. Rep. Michael McCaul said Tuesday that the Austin Republican "has been working with FEMA, Gov. [Greg] Abbott and local officials to identify options for flood mitigation to protect Houston and the surrounding areas from future flood disasters." McCaul may hold extra clout as chairman of the House Homeland Security Committee. But Adrian Garcia, a former city councilman and Harris County sheriff, said he's not optimistic Texas will get much funding for these projects from Congress beyond the multi-billion dollar short-term aid package. "They thought [the Ike Dike] would be the answer to a lot of these problems," Garcia said. "And obviously it is not." Turner's advocacy for the coastal barrier concept is relatively new. Early last year, amid the Texas Tribune/ProPublica investigation, Turner declined an interview request to discuss the need for a barrier. Instead, the city sent statements dismissing the potential impacts — and not indicating whether Turner supported such a project, which dozens of area city councils had enthusiastically endorsed. “Only a small portion of the city of Houston is in areas at risk for major storm surge,” the statement said. “Consequently, hurricane-force wind poses the major threat for the majority of the city." Reminded of a climate change-driven storm scenario FEMA presented in 2014 — in collaboration with the city — that projected a 34-foot storm surge that put downtown Houston underwater, Turner’s office provided a follow-up statement acknowledging that the issue “continues to be a concern.” It also placed the onus on the federal government to take the lead on a coastal barrier project. A few months later, in August 2016, Turner wrote to state leaders studying the coastal barrier concept and said he supported it. On Tuesday, Turner spoke passionately about the impact Hurricane Ike could have had — and the impact Harvey did have — on the region’s industrial complex and the national economy. Correction: A previous version of this story listed U.S. Sen. John Cornyn as one of the officials who signed a letter to President Trump urging federal funding of the coastal spine. Cornyn supports the project but did not sign that letter.